Our candle bags have a unique feel that puts people at ease and makes for a very pleasant atmosphere. 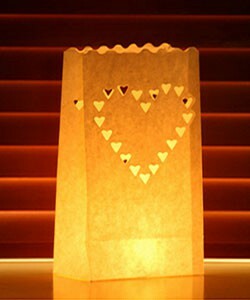 Once lit, our luminaria candle bags have a soft glow, illuminated by candle light and add a touch of class to any event. The light from the candle not only illuminates the bag, but also highlights the pattern. 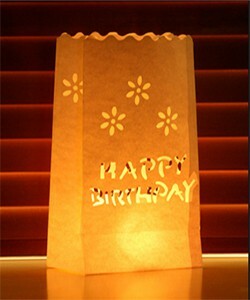 Set your next event apart with these fabulous flame-retardant paper candle bag lanterns. This is one of the cheapest ways to dramatically enhance the ambience of your wedding, engagement party or any celebratory occasion. A luminaria or a farolito is a small paper lantern (commonly a candle set in some sand inside a paper bag) which is of significance among New World Hispanics at Christmas time. Also known as farolito, the paper lanterns have been displayed in Mexico for more than three centuries. It has been said, “fire is the cradle of everything on earth”. It is taken as a symbol of auspiciousness and warmth. Light, and especially candle light, has always been a source of joy and peace and that is particularly true of our candle bags and the many ways they can be utilised. There is something so special about light being used as a beacon, inviting and warm. What could be more inviting to a visitor to your home than a beautiful line of candle bags illuminating the path to your door! They have a unique feel that puts people at ease and makes for a very pleasant atmosphere. Simply pop a little sand, stones or gravel in the base of the bag and then place your tealight candle inside the bag (tealight candles not included but sold separately). Arrange the bags along your pathways, driveway, lawn area or around the pool and patio for a beautiful and amazing subdued lighting effect. 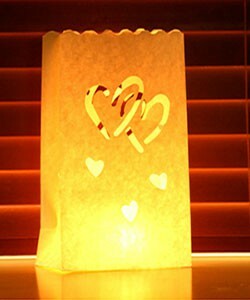 Our candle bags will never fail to generate a positive effect wherever they are used. 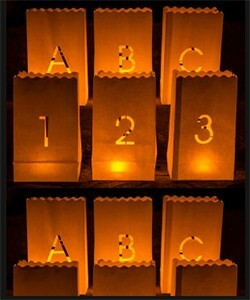 Fantastically simple yet super effective!